With modern PC’s, the boot time is a LOT less than it used to be. There was a time when you would have a few seconds to press F8 when a Windows machine started and it would boot to “safe mode”. Now even with the reflexes of a fighter pilot, you are hard pushed to press the key before it says “Starting Windows”. 1. 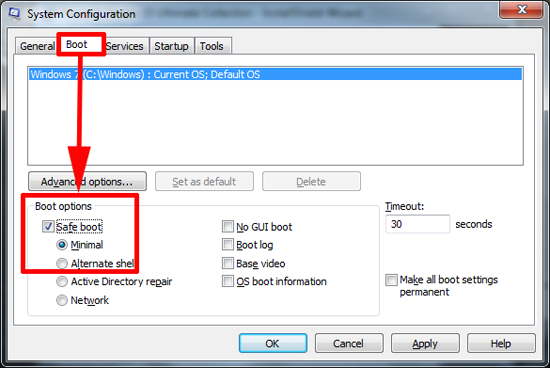 Boot Windows normally, and in the search/run box type msconfig, (or run from command line, whichever you prefer). 2. When msconfig opens select the boot tab > Select “Safe Boot” with the Minimal option selected > Apply OK > You will be asked to reboot. 3. The machine will now reboot into safe mode, when you have done what you need to do simply run msconfig again and Untick “Safe boot” >Apply > OK > Reboot.